Automakers typically work to reduce manufacturing costs by making parts and components that are standard across a model line. The new line of Ford Super Duty trucks introduced at the 2019 Chicago Auto Show this week defies that strategy. Usually a lower cost to produce means more profit margin per vehicle sold, which makes the company as a whole more profitable. Pickup trucks, however, have among the highest profit margins in the business, according to S&P Global Ratings, the corporate credit-rating firm. That allows new pickup trucks to have among the largest number of configurations of engines, trims and other options in the auto industry. “Pickups are the rare exception to the notion that automakers seek to reduce complexity and buildable combinations. Complexity increases cost, and that’s not desirable in most vehicle segments,” said Ed Kim, Vice President, Industry Analysis for the AutoPacific consulting firm. It’s a different story for pickups, Kim said. Pickup customers demand more customization. Depending on how they will use their trucks, one customer may want a specific axle ratio for the loads they plan to tow, while another may desire an axle ratio that gets better fuel economy because they are just using their truck as a car surrogate, commuting back and forth to work. “But it’s not just the truck’s capabilities they want to customize,” he said. Pickup buyers, more than buyers in many other vehicle segments, want to personalize their trucks and make them their own. That’s why there is such a wide variety of wheel designs and interior color themes, especially compared with typical family crossovers or sedans, Kim told Trucks.com. Even something as simple as a grille, often consistent on most cars, varies wildly on pickup trucks. There are seven different grilles available for the new Ford Super Duty lineup, which goes on sale later this year. Each grille is unique to a specific trim level: the XL, XLT, Lariat, King Ranch, Limited, Platinum and the dually, a truck with an extra set of wheels in the rear. Each grille complements the trim of the vehicle, giving it a look that differentiates it from the rest of the offerings. The goal is for vehicles like the King Ranch and Limited to look like they’re from the same vehicle family but are geared to the tastes of individual buyers, said Sean Tant, Ford’s F-Series Design Manager. “The Super Duty series lineup is as diverse as our customers are. The grill communicates the specific image that is appealing to those different customers. It also sets the tone for the rest of the vehicle,” Tant said. Sometimes, design variances are functional. The grille on the Ford’s rugged dually, for example, has two side air vents to cool an engine that designers believe will work harder than other trucks in the line. Ford sold more than 900,000 F-Series trucks in the U.S. last year. But despite the big number, each goes to a customer who often wants their truck to look special among the crowd of trucks on U.S. roads. That starts with the grilles. “Our grilles are designed with unique looks and finishes to complement the rest of the truck – from the mirror caps to the wheels to the grilles, we’re creating one cohesive look for the truck and the customer driving it,” Tant said. The grille has the most design variation because it’s the part most often seen when facing a truck head-on, and it’s the part other drivers see in their rearview mirrors. Ford isn’t the only company looking to using grilles to help create a unique look for each trim of truck. 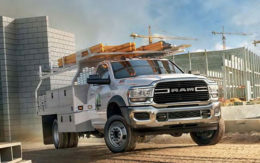 The new Ram Limited and the Laramie Longhorn have grilles designed for two entirely different customers. The Laramie Longhorn has a darker chrome finish and is often paired with a two-tone paint scheme. The Limited is bright chrome with a front bumper that’s either also chrome or painted to match the body. The new Chevrolet Silverado has perhaps the most grille offerings. The Silverado 1500 has eight trim levels with unique grilles. The new Heavy Duty has five different grilles, depending on the trim. To differentiate the 1500 from the 2500 and 3500, Chevrolet put visually different front-end designs on the smaller and larger trucks. The new Heavy Duty look has been polarizing, with the new grille getting intense criticism on social media and among some auto reviewers. Editor’s note: Chad Kirchner is a contributing writer for Trucks.com whose work can be found at various truck outlets online. He can be reached on Twitter @chadkirchner.